The belt is just 1/4" jacquard fabric. I used an old grommet that NOPE'd out of my old bodice as a ring-type fastener. The chemise is made from a cotton hankie. I tried with linen first, but it turns out that linen on a doll this size looks about as thick as a burlap sack. NOPE. What really shocked me were the sheer number of things at Faire that were perfect for this project. This bottle came from the glass etcher's, and was probably meant to be a pendant. Now I just need to decide what sort of neat-looking liquid I should fill it with. This pouch? Was made to hang at a person's hip. 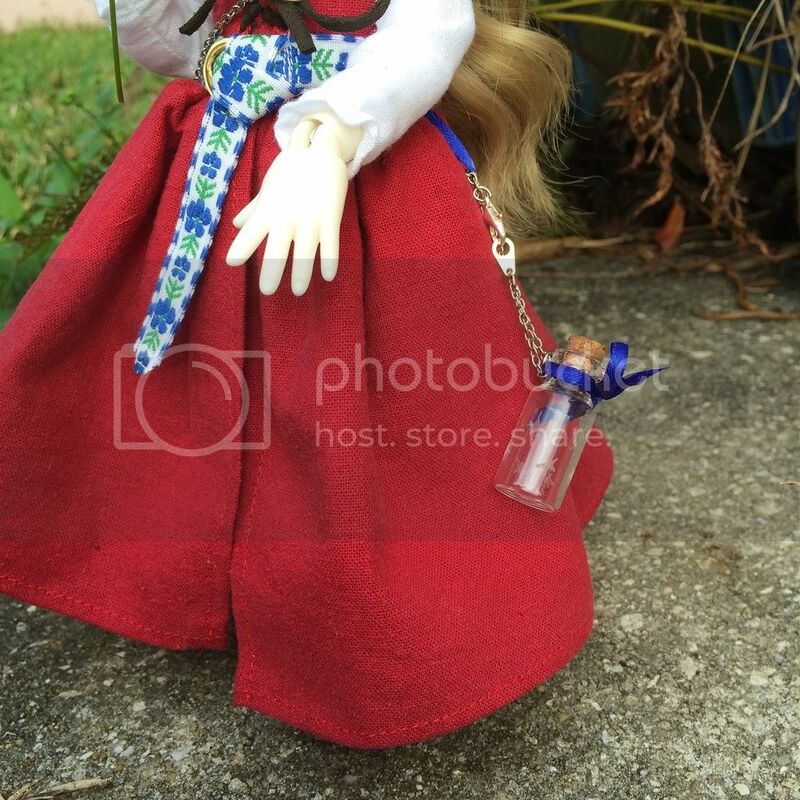 Much too tiny to look right on a real human being IMO, so I snipped the chain and made it a purse for Harriet instead. It's about proportional to the belt pouches I wear. 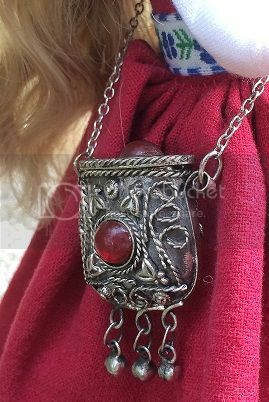 And now to talk about jewelry! The pendant is from an old pair of earrings my mom gave me. I lost one, and couldn't bear to part with the one that was left. So I made it into a tiny wee necklace. And the crazy part is, I'm not finished yet. She's going to have boots made of real deerskin leather AND a nice felt cloak. But she's finished enough for me to bring her to Faire tomorrow and show her off. What about some glow in the dark paint for your bottle? I'm not very familiar with it, but I'd assume it's water based so it could be diluted and dyed very easily if you wanted, and even a little container would give you plenty to experiment with. It will also last a lot longer than the goop out of a glow stick but with much the same effect. It might be a little cliche but the stars on the bottle seem to lend itself to the idea. The leather you're going to use to make boots might also lend itself to making a wine skin for her if you have enough left over. The stopper and any embellishments would be the hard parts since it doesn't really need to hold liquid. Lovely! 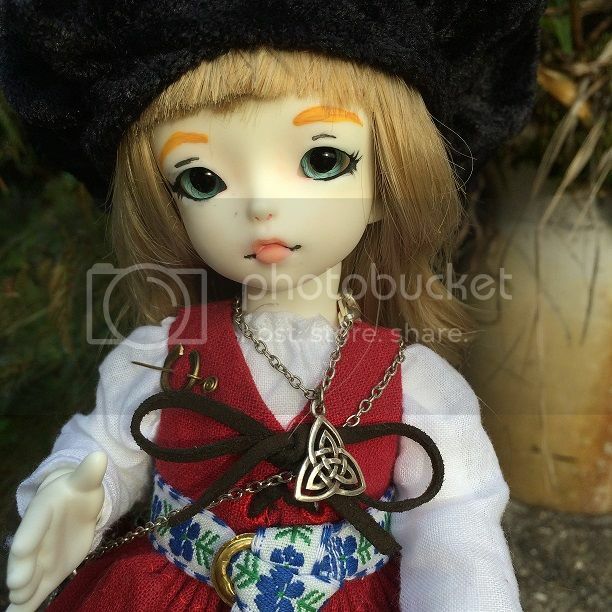 I have a doll I make goth style clothes for. Plus a few period costumes. Part of me's wishing I had the skill to just paint behind the stars so they stand out more. I've also been told that a dried clover might look pretty. As for leather: A friend is making the boots, apparently. But a different friend gave me some super-thin leather scraps, so I'm thinking multiple pairs of doll shoes! 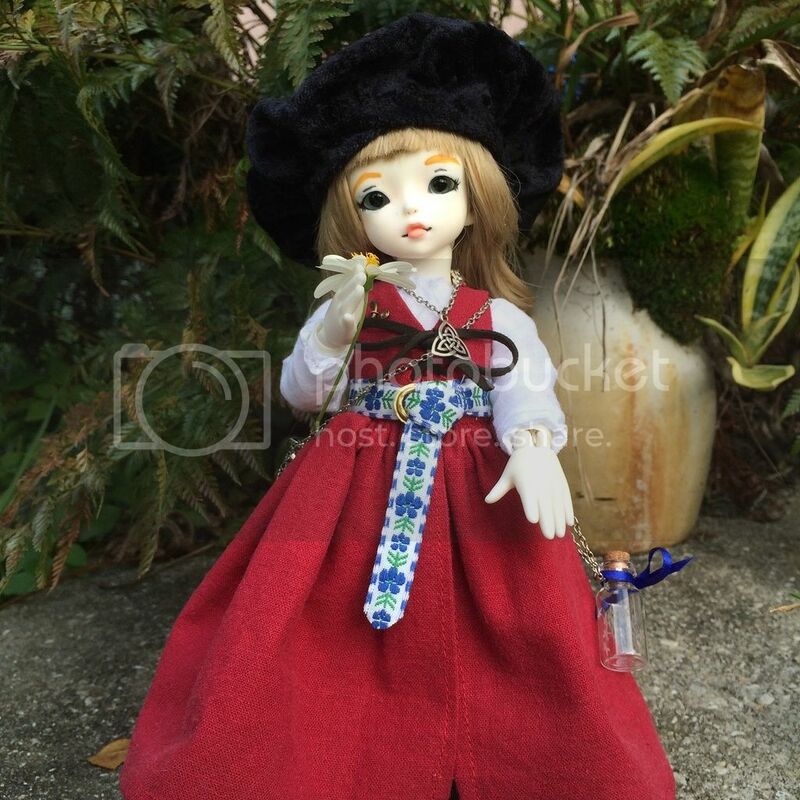 Also, Lucrezia now also has a doll-sized bumroll so the skirt stays OUT like that and doesn't cling to her hips. Pics when everything's finished.